16-year old Caitlin Wood began studying the piano and violin at age four. 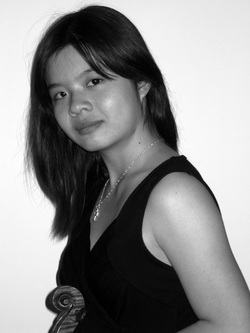 With her virtuoso violin technique and a superior musical understanding, she has already mastered several of the most difficult and demanding works in the violin repertoire such as the Bach Ciaccona, numerous concertos including the Tschaikowsky and Bartok Violin Concertos, Ysaÿe Sonatas, numerous works by Paganini, and so on. At eight years old Caitlin Wood made her debut with the Vancouver Symphony orchestra conducted by Bramwell Tovey, playing the Bach double violin concerto with her brother Ian, which she repeated six times in a series of school concerts. In 2005, she was again invited by Maestro Tovey to perform Lalo’s Symphonie Espagnol with the Vancouver Symphony. Her concert performances include numerous recitals in Italy, California, Calgary, and Vancouver. She is presently a concertmaster of the Vancouver Youth Symphony Orchestra. Caitlin first came to national attention when she won first prize in both the violin and piano disciplines in her age category at the 2001 National Canadian Music Competition in Quebec City. She has also been the major prizewinner of many local festivals. On a BBC radio interview in the UK, Maestro Tovey described Caitlin as one of the bright upcoming musicians in Canada. She is currently a violin student of Prof. Taras Gabora and a piano student of Prof. Lee Kum-Sing at the Vancouver Academy of Music. Caitlin is part of the class of 2011 at York House School. She is an Honours with Distinction student and an active member in the Reach for the Top, cross country and track and field teams.